I've held about a half a dozen yard sales and am an experienced yard sale shopper. Here are some things that I do to target specific shoppers and stay organized when I'm hosting a sale. Advertise your sale. Tell your neighbors of your intentions the week before, at the same time put a sign up in the yard that says, "Yard Sale here Saturday". Post a listing at craigslist.org under the "garage sales" heading. Spend some time making large visible signs. Keep it simple, include an arrow, the words "Yard Sale" and your house number. The morning of the sale post signs at the end of the block. Remember to take them down when you pack up and save them for next year! We've been using our yard sale signs for years. Try to sell larger and more expensive items on Craigslist first. If you have something that is still in great shape and is still sold in stores, chances are you'll probably get more money if you try to sell it on craigslist than at a yard sale. Craigslist.org is free to post so it doesn't hurt to try. Post signs that specify larger amounts of goods for sale. I make my signs on the computer in large bold font that fills up the whole paper and hang them on the porch posts up high. Some examples include: "Boys Clothes 3T", "Women's Shirts Size M", "Men's Shoes, Size 12", "Toys, Toys, Toys", "Kitchen Gadgets", "Tools and Garden Equipment". Print out an extra sign to hang on the table or box where the specific items are located to make it easier to locate items and reorganize later in the day. Keep as much off the grass as possible. I only put large bulky items on the ground. Everything else is on tables or in boxes on benches so shoppers do not have to bend down or kneel. Have small bills and change ready. The week before the sale I start saving small bills and change for the early bird customers. It's been my experience that the first customers usually only have a $20 bill, and once I even had a man pay with a $100 bill! Have plastic bags on hand for people who buy a lot of stuff. Some customers will love your taste and will pick up several items. They will need a bag to carry it all home. It helps to be creative, if you have a huge amount of purses that aren't selling, stuff the items in a purse and tell them the purse is free. One time I had an abundance of sand buckets and told the children that they can have the bucket and all the little toys they can fill in it for $1. They loved the idea and the parents were happy that it kept them busy while they sorted through the clothing piles. Grab some spray cleaner and paper towels and dust things off. People will pay more for things if they look clean and in good shape, so grab some cleaner and make it shine. A Mr. Clean Magic Eraser can get mysterious hard to remove marks off of most anything. If you have time bake some cookies! If you have a gift for making the perfect cookie then whip up a few batches the night before. Wrap them in cellophane or Ziplock bags and sell 2 or 3 for $1. Set up an area with the cookies, water, or other snack items you happen to have in the house and you'll make a few extra dollars. I've found that later in the day as the items left for sale are diminishing most people will end up buying a bag of cookies even if they don't see anything else they want. TIP: Kids go crazy for anything with sprinkles and m&m candies. They'll beg their parents for a bag of cookies and parents usually give in! Know when to call it a day. At our house around 11 o'clock it starts to wind down, customers aren't as frequent, people will slow down in their cars to look but most drive on. We experimented one year with a sign that said, "Everything 25 cents, no joke!" I stood at the curb for an hour and held it up at every passing car and surprisingly it worked! About half of the interested shoppers stopped and picked up something, and those that didn't buy anything bought cookies. We still do the "25 cent blow out" at every yard sale. Plan what to do with your items after the yard sale. If it's a small amount you can leave it near the curb with a "FREE" sign. If you have a bit more to get rid of, read places to donate your stuff here. 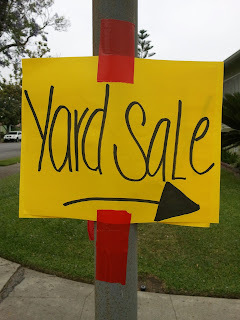 Read more about yard sales!